Inside the WashCo BTC’s Frans Pauwels Memorial Bicycle Center. From left to right: Volunteer Al Martinez, Hal Ballard, and founding staff-member Mark Norbert. With the tragic death of Bret Lewis last month, many people in the Portland metro area have become more aware of the challenging road conditions faced by people who choose to bike in Washington County. Last week, I stopped in to learn what advocates at the Washington County Bicycle Transportation Coalition (WashCo BTC) are doing to improve those conditions. WashCo BTC’s headquarters are located just off of Tualatin-Valley Highway in Aloha, in the thriving Frans Pauwels Memorial Bicycle Center. 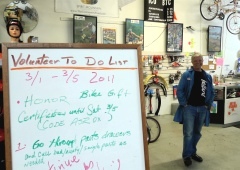 Similar to Portland’s Community Cycling Center, the Bicycle Center has a full-service bike shop and service center that focuses on low-cost parts and service for underserved communities. WashCo BTC director Hal Ballard believes that his customers, many of them Latino, are too often intimidated by more traditional bike shops in the area. 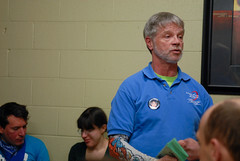 Through their “Earn a Bike” program, people can volunteer with the organization in return for service and/or a bike of their own. This lack of a grid and the dominating presence of high-speed, multi-lane arterials like TV Highway and Farmington are major problems in Washington County. They lead to dangerous crossings like the one at TV Highway and SW Tualaway where Bret Lewis was hit and killed and many people risk there lives at every day. Even in light of daunting challenges, Ballard is hopeful they will be able to make a difference in the coming years. For instance, Hillsboro is moving forward with its 2020 Vision Plan, and as far as transportation issues are concerned, WashCo BTC is an important partner. In fact, they are assisting the city with all but one of the eight projects listed in the Vision Plan’s “Enhancing Neighborhoods and Districts” section. Two of these projects, the “Integrated Bike Network” and developing Safe Routes to School, are set to begin this year. Teaching kids about bicycling is a hallmark of the WashCo BTC. They currently partner with Hillboro Parks and Recreation on the BLAST Youth Program during the school year and WashCo BTC has developed its own curriculum with the Youth Skills 123 program, which they teach at local elementary schools and the Hillsboro Farmer’s Market during the summer. Though they face numerous challenges, WashCo BTC is working hard to make a mark on Washington County’s transportation system. Progress in Hillsboro, the growth of their education programs, and the partnerships they are developing with area businesses are all signs of positive momentum. You can join the WashCo BTC on May 18th for a Ride of Silence to remember Bret Lewis and on July 23rd they’ll host the annual Tour de Parks ride in Hillsboro. Learn more about the WashCo BTC at WashingtonCountyBikes.org. Patrick, thanks again for the shout out to Washington County and the challenges we share out here! Connectivity for bikes is a problem out in Washington County. It’s an agricultural county with a road system fitting that use, upon which hustling, bustling urban/suburban development has been forced. Bike traffic gets the modestly provided for, crummy, side of the road bike lane treatment, if any at all. This time of year, welcome to road junk and flat tires. Ballard and crew are doing a lot of good things for the community with the programs and all. Despite being on TV Hwy, the bike center is hard to find, located as it is, amongst a cluster of commercial office suites situated slightly below street level. Address is: 21785 SW Tualatin Valley Hwy, Suite J. That’s just east of Cornelius Pass Rd. Also…just west of the big 20′ tall Harvey’s Bunny statue. When in there a few weeks ago, the shop had a couple nice, vintage fixer upper classic town bikes for $50…a womens and a mens, one with 3sp. Also, a nice, older, steel Canadian made road bike for $150. Keep up the good work guys! Washington County is probably better than most suburban counties in this country — at least close to the Beaverton core, many of the major arterials have bike lanes, the core employment zone is bisected by bike-friendly light rail, and thanks to the UGB there are still miles of relatively quiet rural roads. But as mentioned already, vehicle speeds are high, left turns can be daunting, bike hooks on the trains are often full, and connectivity is often lacking. I had no idea the bike center was there (I try to avoid going any further west than I have to) but will have to check it out. GlowBoy…do check it out, so at least you know where it is and you can help others find their way to it. The place seems too quiet to me. Has lots of potential though. Needs energy, but the lack of it here isn’t the bike coalitions fault. In the surrounding area, if there was as much general interest in biking as there was in Portland, (the alberta area is kind of an extreme example … . ), the place would be hoppin’. That Ballard mentions business from the Hispanic community says a lot. For most of the people that can afford cars, this is still heavy driving country. One last note on connectivity: Continuing west to Hillsboro from the bike coalition (essentially from Cornelius Pass Road. ), is a major drag. Unless the shoulder of TV Hwy is taken…it’s nice and wide, but still…riding along what’s essentially a freeway, is not exactly wonderful… it’s a circuitous route with cul-de-sac traps awaiting. There’s definitely room for some visionary road planning here. Possibly buying up some of those tract houses and building an east-west bike/pedestrian connecting route through the neighborhoods (paralleling TV Hwy but a good distance away from it.) is something I like to think about. While I appreciate what the WashCoBTC has done, I think they really messed things up with the Tour de Parks. What started out as a free, sponsored, family fun event, turned in to a $20 per adult (still sponsored heavily though) event. My wife and I rode the course for free on the weekend after the official event (with a pretty good group of others) because $40 was way too much to spend! $5 or maybe even $10 per adult makes a lot more sense. Your statement about heavy sponsoring is off the mark, Chris. Almost all the sponsorship was “in-kind” and not the cash type. Beside $1000 from SolarWorld and $1800 in registrations, there was no $ invested by anyone but the WashCo BTC. Please look further into the situation before you make unsubstantiated comments. How much to ride in Bridge Pedal, Chris. $5, $10? Chris: you’ll be happy to hear the 4th annual Tour de Parks has returned to a FREE, FAMILY, FUN event on July 23rd along with Celebrate Hillsboro. The Le Grand Tour-a 60+ mile ride will have a registration fee of $25.00 and is a supported ride. 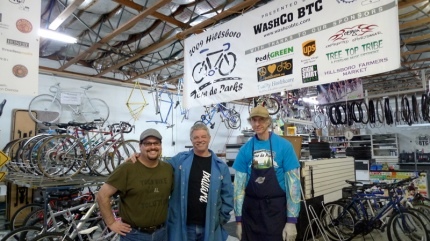 The Frans Pauwels Community Bike Center has moved as of March 2012 from its old location to the renamed WashcoBTC Community Bike Center at 137 NE 3rd Avenue Hillsboro 97124. The phone number there is 503-844-9740. Winter hours of operation are Tuesday thru Saturday 11:00am to 5:00pm and the manager is Tim Mitchelldyer. Hal Ballard is no longer involved directly in the Washco BTC.